How to draft an Employee Offer Letter? Download this Employee Offer Letter template now! We support you and your company by providing this Employee Offer Letter HR template, which will help you to make a perfect one! This will save you or your HR department time, cost and efforts and help you to reach the next level of success in your work and business! This Employee Offer Letter has ways to grab your reader’s attention. They are crafted by HR professionals, are intelligently structured and easy-to-navigate. Pay close attention to the most downloaded HR templates that fit your needs. 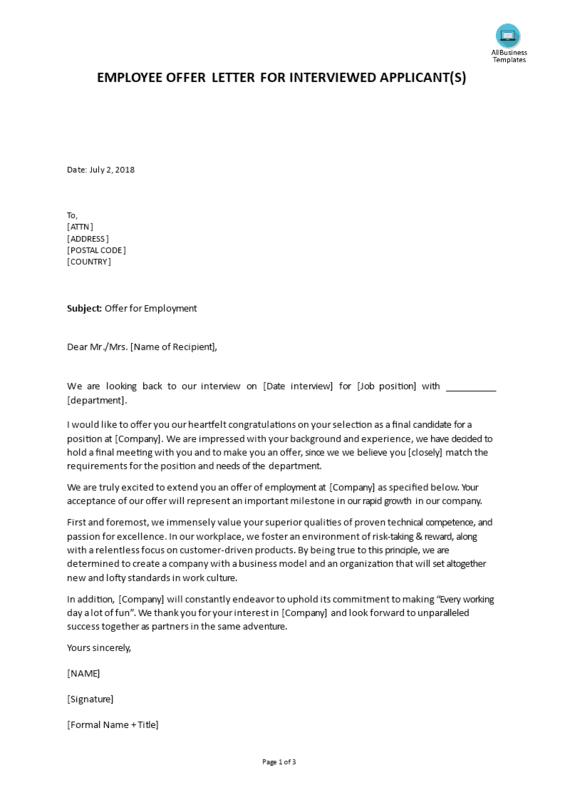 Download this Human Resources Employee Offer Letter template now! Offer of Employment Dear, I would like to offer you our heartfelt congratulations on your selection as a final candidate for a position at Company. We are offering you an annual salary of , in addition to your being eligible for a target annual bonus of up to 30 of your base salary (prorated based on your start date), and a recommendation to our Board of Directors (or an authorized committee) to approve an equity grant of either restricted stock units (RSU) with respect to shares OR stock options.